The name Viento is the Spanish word for wind, and this brisk vineyard is aptly named, as the dependable winds for which Greenfield is known come howling down the vineyard corridor every afternoon about 2 p.m. These cool and windy conditions allow for slow ripening and the cultivation of top-notch wine grapes. 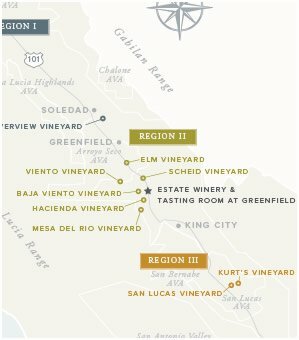 Located on the western side of the Salinas Valley at the mouth of the Arroyo Seco River, Viento Vineyard has the attributes associated with a premier winegrowing site. This micro-climate is noted for its moderate weather conditions and cool afternoon winds and is ideal for cool climate varietals. Evening coastal fogs in the spring and summer often linger until mid-morning the following day. This natural cooling effect slows photosynthesis and causes a unique lengthening of the growing season. 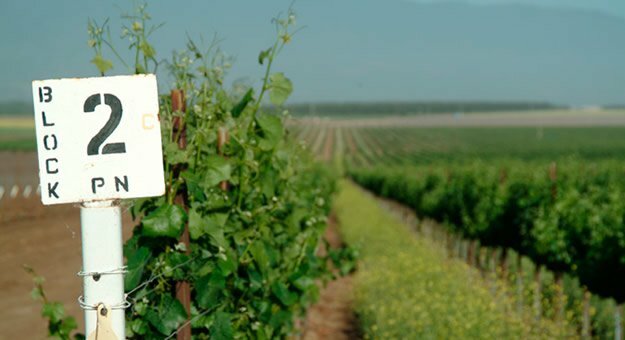 Four varietals are grown on Viento: Chardonnay, Gewürztraminer, Riesling, and Pinot Noir. The Chardonnay from this region presents the classic coastal flavors that are fruit-forward, crisp, and apple-flavored, with a hint of minerality. Gewürztraminer is a lovely, floral wine grape that can run the gamut from dry to sweet, standard to late harvest. The Viento site allows us to keep the Gewürz on the vine until it has reached optimal maturity. Riesling is a difficult wine grape to grow and well-suited to the cool growing conditions of the Greenfield zone. It exhibits floral flavors with grapefruit and honeysuckle notes and terrific acidity, an essential quality for Riesling. The Pinot Noir from Viento Vineyard is special and is often the home of our vineyard-designated Pinot Noir Reserve Clone Series. 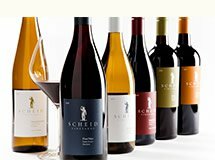 These single clone, single vineyard bottlings are a true reflection of the terroir of the Viento Vineyard and allow us to showcase the distinct attributes of an individual clone. Viento is planted to six different Pinot Noir clones (we grow a total of 17 different clones on six different vineyards): Dijon clones 115, 667, 777, Pommard, 828 and 943. What do we mean by “clone”? Grapevines in general, and Pinot Noir vines in particular, are genetically unstable and can mutate slightly over time. Each grape variety, therefore, is actually made up of many subtypes, called clones. These clones can result in different flavors, intensity, color, etc. For example, Pinot Noir clone 667 is known for dramatic color and silky texture, clone 777 has exotic spice aromas, and clone Pommard is an outstanding all-around clone with vibrant cherry flavors. The differences may be subtle but to wine geeks (we salute you), it is the delicate nuance of each specific clone that is one of the most intriguing aspects of Pinot Noir.